Purpose is to demonstrate how to create HA for Bi-Directional Replication Goldengate installed on ACFS with RAC cluster using XAG. XAG simplifies the process since there are no requirements to create action scripts. Please review REFERENCE section for versions used in test case and versions requirements. Goldengate is installed on ACFS for simplicity; otherwise, at a minimum the following directories br, dirchk, dirdat, dirtmp will need to be on shared storage with symbolic links if installed on local storage. Keyword is minimum until you find out more directories are required. Role separation was a huge PITA and do not attempt to perform chmod -R 775 /u01 as it will break since the setuid get unset. 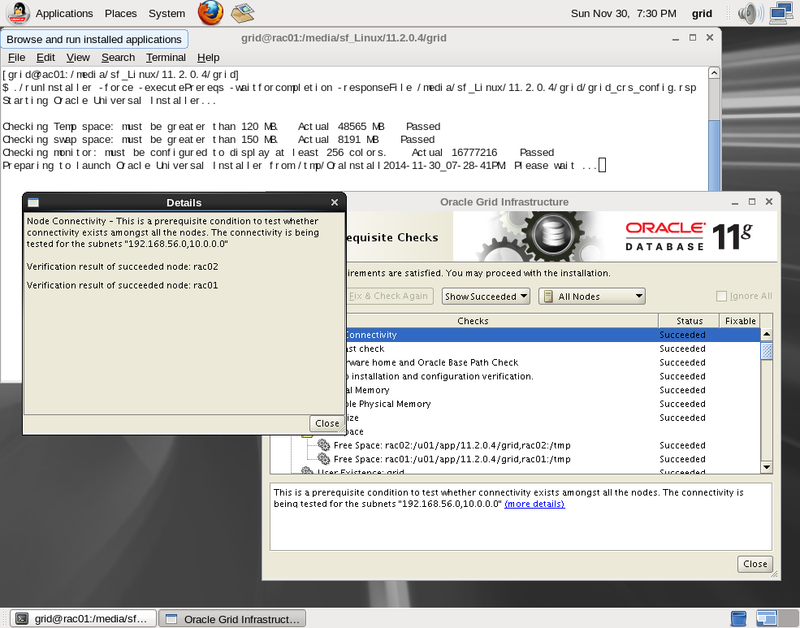 Even with chmod 6751 oracle may prove to be ineffective and relink was done. Last, DO NOT stop Goldengate using ggsci. For cluster-aware Goldengate, use $XAG_HOME/bin/agctl. The configuration shown is for one cluster only and the same would have to be performed on the other clusters. 2014-12-14 10:58:42: Executing /u01/app/11.2.0.4/grid/bin/crsctl add resource lax-ggate1-vip -type app.appvip_net1.type -attr "USR_ORA_VIP=192.168.56.41,START_DEPENDENCIES=hard(ora.net1.network) pullup(ora.net1.network),STOP_DEPENDENCIES=hard(ora.net1.network),ACL='owner:root:rwx,pgrp:root:r-x,other::r--,group:oinstall:r-x,user:root:r-x',HOSTING_MEMBERS=rac01.localdomain,APPSVIP_FAILBACK="
2014-12-14 10:58:42: Executing cmd: /u01/app/11.2.0.4/grid/bin/crsctl add resource lax-ggate1-vip -type app.appvip_net1.type -attr "USR_ORA_VIP=192.168.56.41,START_DEPENDENCIES=hard(ora.net1.network) pullup(ora.net1.network),STOP_DEPENDENCIES=hard(ora.net1.network),ACL='owner:root:rwx,pgrp:root:r-x,other::r--,group:oinstall:r-x,user:root:r-x',HOSTING_MEMBERS=rac01.localdomain,APPSVIP_FAILBACK="
$ crsctl stat res -w "TYPE = ora.database.type"
Options for –instance_type is source|target|dual and I am interpreting dual is bi-directional. !!!!! PLEASE CONNECT TO NODE WHERE GOLDENGATE IS RUNNING !!!!! echo "!!!!! PLEASE CONNECT TO NODE WHERE GOLDENGATE IS RUNNING !!!!!" echo "~~~~~ GOLDENGATE IS RUNNING ON THIS NODE - GOOD TO GO    ~~~~~"
It’s easy to know where everything when you are the architect, but what happens when you are not? How to find the Goldengate VIP and is it in DNS? Adapt or die and re-learning command line again. Better to verify before installation than to clean up a problematic install. Check: Node reachability from node "rac01"
Result: Node reachability check passed from node "rac01"
Check: User equivalence for user "oracle"
Result: User equivalence check passed for user "oracle"
Interface information for node "rac02"
Interface information for node "rac01"
Result: Node connectivity passed for interface "eth1"
Check: TCP connectivity of subnet "192.168.56.0"
Result: TCP connectivity check passed for subnet "192.168.56.0"
Check: Node connectivity for interface "eth2"
Result: Node connectivity passed for interface "eth2"
Check: TCP connectivity of subnet "10.0.0.0"
Result: TCP connectivity check passed for subnet "10.0.0.0"
Subnet mask consistency check passed for subnet "192.168.56.0". Subnet mask consistency check passed for subnet "10.0.0.0". Subnet mask consistency check passed. Check of subnet "192.168.56.0" for multicast communication with multicast group "230.0.1.0" passed. Check of subnet "10.0.0.0" for multicast communication with multicast group "230.0.1.0" passed. Check of multicast communication passed. Check: Free disk space for "rac02:/u01/app/oracle/product/11.2.0.4/db_1,rac02:/tmp"
Result: Free disk space check passed for "rac02:/u01/app/oracle/product/11.2.0.4/db_1,rac02:/tmp"
Check: Free disk space for "rac01:/u01/app/oracle/product/11.2.0.4/db_1,rac01:/tmp"
Result: Free disk space check passed for "rac01:/u01/app/oracle/product/11.2.0.4/db_1,rac01:/tmp"
Check: User existence for "oracle"
Result: User existence check passed for "oracle"
Check: Group existence for "oinstall"
Result: Group existence check passed for "oinstall"
Check: Group existence for "dba"
Result: Group existence check passed for "dba"
Check: Membership of user "oracle" in group "dba"
Check: Hard limits for "maximum open file descriptors"
Result: Hard limits check passed for "maximum open file descriptors"
Check: Soft limits for "maximum open file descriptors"
Result: Soft limits check passed for "maximum open file descriptors"
Check: Hard limits for "maximum user processes"
Result: Hard limits check passed for "maximum user processes"
Check: Soft limits for "maximum user processes"
Result: Soft limits check passed for "maximum user processes"
Check: Kernel parameter for "semmsl"
Result: Kernel parameter check passed for "semmsl"
Check: Kernel parameter for "semmns"
Result: Kernel parameter check passed for "semmns"
Check: Kernel parameter for "semopm"
Result: Kernel parameter check passed for "semopm"
Check: Kernel parameter for "semmni"
Result: Kernel parameter check passed for "semmni"
Check: Kernel parameter for "shmmax"
Result: Kernel parameter check passed for "shmmax"
Check: Kernel parameter for "shmmni"
Result: Kernel parameter check passed for "shmmni"
Check: Kernel parameter for "shmall"
Result: Kernel parameter check passed for "shmall"
Check: Kernel parameter for "file-max"
Result: Kernel parameter check passed for "file-max"
Check: Kernel parameter for "ip_local_port_range"
Result: Kernel parameter check passed for "ip_local_port_range"
Check: Kernel parameter for "rmem_default"
Result: Kernel parameter check passed for "rmem_default"
Check: Kernel parameter for "rmem_max"
Result: Kernel parameter check passed for "rmem_max"
Check: Kernel parameter for "wmem_default"
Result: Kernel parameter check passed for "wmem_default"
Check: Kernel parameter for "wmem_max"
Result: Kernel parameter check passed for "wmem_max"
Check: Kernel parameter for "aio-max-nr"
Result: Kernel parameter check passed for "aio-max-nr"
Check: Package existence for "binutils"
Result: Package existence check passed for "binutils"
Check: Package existence for "compat-libcap1"
Result: Package existence check passed for "compat-libcap1"
Check: Package existence for "compat-libstdc++-33(x86_64)"
Result: Package existence check passed for "compat-libstdc++-33(x86_64)"
Check: Package existence for "libgcc(x86_64)"
Result: Package existence check passed for "libgcc(x86_64)"
Check: Package existence for "libstdc++(x86_64)"
Result: Package existence check passed for "libstdc++(x86_64)"
Check: Package existence for "libstdc++-devel(x86_64)"
Result: Package existence check passed for "libstdc++-devel(x86_64)"
Check: Package existence for "sysstat"
Result: Package existence check passed for "sysstat"
Check: Package existence for "gcc"
Result: Package existence check passed for "gcc"
Check: Package existence for "gcc-c++"
Result: Package existence check passed for "gcc-c++"
Check: Package existence for "ksh"
Result: Package existence check passed for "ksh"
Check: Package existence for "make"
Result: Package existence check passed for "make"
Check: Package existence for "glibc(x86_64)"
Result: Package existence check passed for "glibc(x86_64)"
Check: Package existence for "glibc-devel(x86_64)"
Result: Package existence check passed for "glibc-devel(x86_64)"
Check: Package existence for "libaio(x86_64)"
Result: Package existence check passed for "libaio(x86_64)"
Check: Package existence for "libaio-devel(x86_64)"
Result: Package existence check passed for "libaio-devel(x86_64)"
The Oracle Clusterware is healthy on node "rac02"
The Oracle Clusterware is healthy on node "rac01"
GSD node application is offline on nodes "rac02,rac01"
Checking all nodes to make sure that search entry is "localdomain" as found on node "rac02"
SCAN Name         Node          Running? ListenerName  Port          Running? All nodes have same "hosts" entry defined in file "/etc/nsswitch.conf"
Database version "11.2" is compatible with the Clusterware version "11.2.0.4.0". Pre-check for database installation was successful. INFO: Users With Same UID: This test checks that multiple users do not exist with user id as "0". TCP connectivity check failed for subnet "10.0.2.0"
TCP connectivity check passed for subnet "192.168.56.0"
TCP connectivity check passed for subnet "10.0.0.0"
I understand the error is ignorable but why create an ignorable error in the first place? Next, I would like to look at the bottom line to know if the check passed for failed and if the failure is false positive, then it would require wasted time for investigation. A better alternative is to exclude eth0 from the check using -networks eth1,eth2 to have successful setup. Pre-check for cluster services setup was successful. Check: User equivalence for user "grid"
Result: User equivalence check passed for user "grid"
Result: Check for ASMLib configuration passed. Check: Free disk space for "rac02:/tmp"
Result: Free disk space check passed for "rac02:/tmp"
Check: Free disk space for "rac01:/tmp"
Result: Free disk space check passed for "rac01:/tmp"
Check: User existence for "grid"
Result: User existence check passed for "grid"
Check: Membership of user "grid" in group "dba"
Reverse path filter setting is correct for all private interconnect network interfaces on node "rac02.localdomain". Reverse path filter setting is correct for all private interconnect network interfaces on node "rac01.localdomain".